Same old, same old in Britain too! The new legislation also paves the way for oversees video evidence to be used in federal courts, which is basically tantamount to a welcoming of evidence obtained under torture. British MI5 openly embraced torture last week when they stated they will use evidence obtained by torture and treat it as reliable. Australian Prime Minister Howard is facing an uphill battle trying to justify these draconian laws, he's getting opposition from doctors organizations, human rights organizations, artists, musicians, TV stars. So what do we see in the news today? Australian authorities have received specific intelligence that terrorists are planning an attack on the country, Prime Minister John Howard said Wednesday, calling on lawmakers to increase the powers of Australia's intelligence agencies. So just coincidentally as he's facing vociferous opposition to these terror laws, our useful Al-Qaeda friends pop up and help the Prime Minister push through his political agenda. 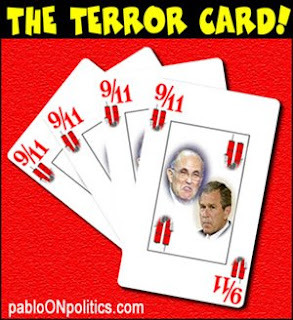 He's playing the terror card. No details of the threat were given, just as the New York subway threat turned out to be a hoax for Mayor Bloomberg to use it as one-upsmanship in his election and to gain approval points. On the other side of the world in Britain we see exactly the same process. Labour is trying to push through more police state laws, including spreading the shoot to kill policy to domestic affairs. So if a husband and wife are having an argument the police can just turn up and gun someone down. Also, 90 day detentions without trial are being included on the basis that computer hard drives are larger than they were five years ago so it takes more time to sift through the evidence. So in ten years when we all have 2,000 gig hard drives, will that mean indefinite detention for 900 days, three years? This would rival but still not top the Bush administration's creation of secret gulags around the world, at which Jose Padilla, an American citizens has now been interned without trial for three and a half years. These laws are on the table and what does Ian Blair the police chief come out and announce? We've prevented terrorist attacks and there are more attempted attacks on their way. Ray McGovern, former CIA analyst, recently warned that governments would "play fast and loose" with terror alerts in order to advance their domestic and foreign political agendas. It's a cliched tactic. They have cried wolf so many times that there in no credibility behind these threats and the public are becoming numb to them. Let us hope that a provocation or staged terror attack is not used to jolt the masses from their ignorance and again rally them behind supporting their own enslavement. INDONESIAN [politicians,] police or military officers may have played a role in the 2002 Bali bombing, the country's former president, Abdurrahman Wahid has said.